Since 1863, the United States has been celebrating a day of feast, complete with turkey, pies, stuffing, and too much more deliciousness to name. But Thanksgiving isn’t just about eating a plentiful dinner and slipping into a tryptophan-induced afternoon nap, it’s a day dedicated to reflecting on all we are thankful for, gathering around the table with friends and family, and enjoying a meal prepared by all. While Thanksgiving has only been an official holiday since the days of Abraham Lincoln, the tradition of gathering together to enjoy a large dinner with friends has been in around since the Pilgrims and Native Americans enjoyed the first Thanksgiving meal together. Although the custom of joining together and eating hasn’t changed much since those first Thanksgiving dinners, oral health care sure has. With all of the advancements in modern dentistry, it’s difficult to imagine a life where there weren’t toothbrushes available at every supermarket, drug store, and gas station, but there was a time when folks didn’t even know what a toothbrush was. At my dental office in Glen Allen, we want to dedicate this seasonal blog to talking about how Pilgrims and Native Americans took care of their grins and how dental health, along with dental care, has changed. It’s a bit of an understatement to say that the Pilgrims didn’t have the best oral hygiene standards. They didn’t have access to proper toothbrushes and toothpaste because they hadn’t been invented yet! Instead, Pilgrims used leaves, herbs, and salt rubbed directly onto their teeth to clean their not-so-pearly whites. For a toothbrush, pig hair was affixed to a twig or animal bone, or sometimes pine bristles were used. Basically, the Pilgrims, who were new to the States and unfamiliar with what was available to them, used whatever items they could find to clean their teeth. Today, we have multiple types of toothbrushes, toothpaste flavors, floss, and other dental hygiene products. Not to mention we have the ability to see a trained dentist in Glen Allen twice a year for checkups and when we have a problem. 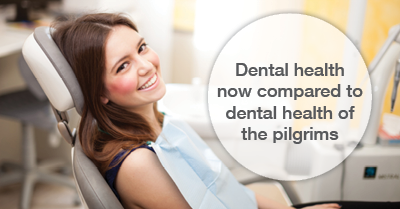 Chances are, the Native Americans had better overall dental health than the Pilgrims. Not only were they more familiar with the land and what was available to them, their diet was healthier. Like the Pilgrims, they also used herbs like sage to clean their teeth, but they used the cucacua plant to make a substance similar to toothpaste. Additionally, while the Pilgrims were eating dried meat and fruits, beans, and a lot of hardtack – a dry biscuit made of flour, water, and salt – the Native Americans were living off the land and eating more balanced meals of veggies, nuts, and berries. Therefore, they were eating fewer smile-damaging foods to begin with. This Thanksgiving, take a tip from the Native Americans and try to eat a well-balanced plate (or plates!) of food and try to take it easy on the sugar-filled sweets. And when you’re reflecting on what you’re thankful for, don’t forget to be thankful for toothbrushes, toothpaste, floss, and modern dentistry as a whole. For it is these advancements in dentistry, plus visits to my Glen Allen dental office, that allow us to have healthy, white smiles every Thanksgiving and all the days in between. Serving patients in Glen Allen, Richmond, and Short Pump. Posted November 19, 2014 by Glenn Fortner & filed under General Dentistry.